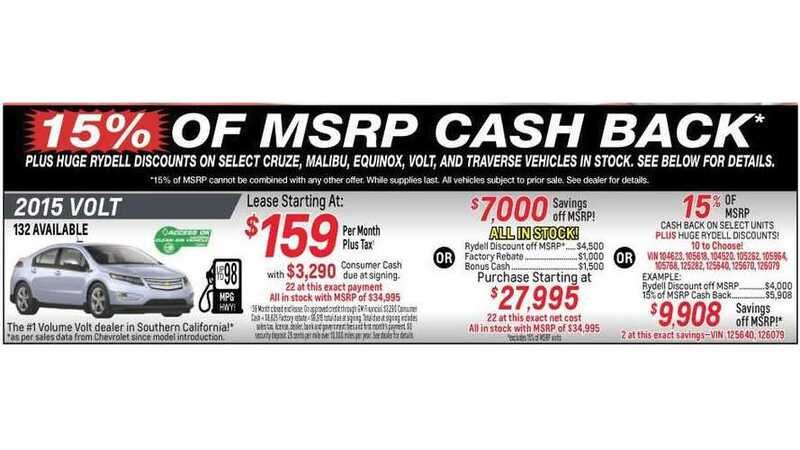 Rydell Chevrolet of Northridge, California has a few swell deals right now on the 2015 Chevrolet Volt. The headline deals is a $159 per month lease. The fine print is rather difficult to see, but it states that it's a 36-month, 10,000-mile per year lease. The $3,290 due at signing includes tax, license fees, dealer and government fees and first month payment. The buy deals on the 2015 Volt are hard to beat too.